← FREE Krispy Kreme Chocolate Glazed Donut! One pantry staple I always keep, ever since I started preparing bento is nori. Those flattened sheets of seaweed that’s most commonly used for wrapping rolled sushi come in very handy when making designs on your food. For this simple lunch, the addition of little connected paperdolls made it a bit cheerier. For me at least. 😛 Granted, the nori’s color can be a bit limiting but I guess it all depends on your design. And yes, nori’s also the answer to the question, “How do you make eyes?” Well, cheese and nori! Under the nori girls is my rice, and opposite that tier is a serving of Tsukune, Japanese chicken balls in a teriyaki glaze, whole kernel corn and quail eggs. All in all, a filling lunch by itself, but still, a little addition of cute never hurt any body, don’t you agree? This entry was posted in bento and tagged bento, nori, obento, pantry, seaweed, staple, tsukune. Bookmark the permalink. What eerie shadow children? I obviously wasn’t paying much attention to the Howl Movie—my attention was slipping during the second half. I guess I’m too much a fan of the book. Bad cow! Bad kao! This looks yummy, and cute to boot. I never would have though of that, but it seems so obvious now! I love the nori paperdolls, what a cute idea. 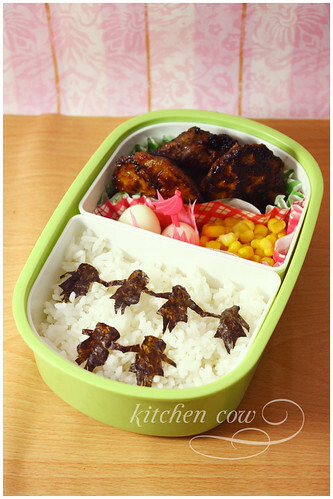 Wow… you have a cute site here and I just cant stop starring at the bento… yummy…! I love this! I am Italian and Japanese! I am addicted to Benot making! I love your site, and had great fun making the Nori Paperdoll Bento. I hope you enter me in the giveaway! You might believe it to be small, but I think you are quite generous!!! My apologies but the Bento giveaway contest was held last year. It’s long been finished and a winner has been picked. Please do stay tuned for future contests though.